Budget and Marketing Mobile Catering? Hello there David I've read some of your articles which I've found quite helpful and I'm definitely considering buying your course. My mate and I are planning on starting a mobile catering business selling Chinese and Japanese dishes. We have no prior experience in cooking this kind of food before so I was thinking that should we of hire a chef for short a while and learn from him or learn ourselves through books and the internet? I'm 17 and my friend is 19yrs old so we are both young and this will be our first experience in the world of business. We are also deciding on either opening a savings account or a business account depending on which offers the best rates as we are planning on getting an overdraft of approx £10,000 for the trailer, car, advertisement,food supplies and other costs. Comments for Budget and Marketing Mobile Catering? 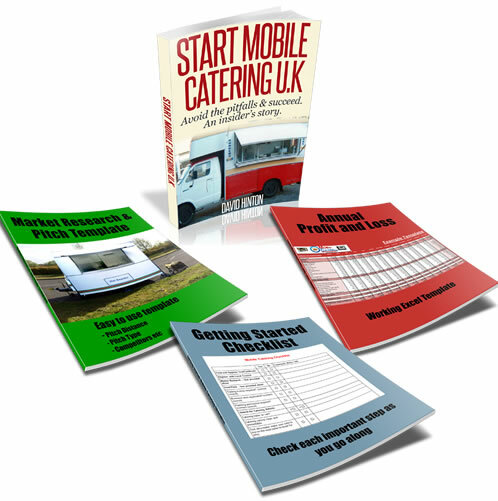 A £10,000 overdraught is enough to get started with your own mobile catering business, the only doubts that I have for you both is your choice of food. Especially if you don’t have any experience with preparing, cooking and storing this type of food. Hiring a chef would be expensive and eat in to your profits very quickly. I also feel that you would need to be situated in very specific area such as a food hall within a shopping centre to take full advantage of your food choices. I would feel better if you went with the more traditional choice of foods that most mobile caterers sell all year round. Furthermore it’s also the type of food that you could easily prepare, cook and sell without the need to hire a chef. Also with Chinese/Japanese types of foods, what would you sell as a breakfast choice which is normally one of the busiest periods for mobile caterers? This type of food will probably be great at large events that attract a large footfall of people, but I’m not convinced it’s for the everyday person. Go ahead and start the business, but research thoroughly the types of food you want to sell. Carry out some basic market research in the areas that you want to trade, to get a better idea of what people expect to see on your menu.